Eight students from Santa Cruz elementary and middle schools were recognized as winners of the annual Santa Cruz Recycles and Prevents Litter! Poster Contest in a City ceremony on Oct. 4. Their winning artwork was unveiled on the sides of City recycling and refuse trucks and downtown big-belly solar compactor trash bins where it will be displayed over the next year. “Keep the World Clean” by Mission Hill student Daisy. Four truck artwork awards were given to Mission Hill Middle School student Ruby, Westlake Elementary School student Cassidy, Gault Elementary School student Jazmine, and Holy Cross School student Karolina. The four big-belly bin winners were DeLaveaga Elementary School student Madeline and three Mission Hill Middle School students: Lyla, Samuel and Daisy. Left to right: Lyla, Samuel and Madeline. The Santa Cruz Recycles and Prevents Litter! 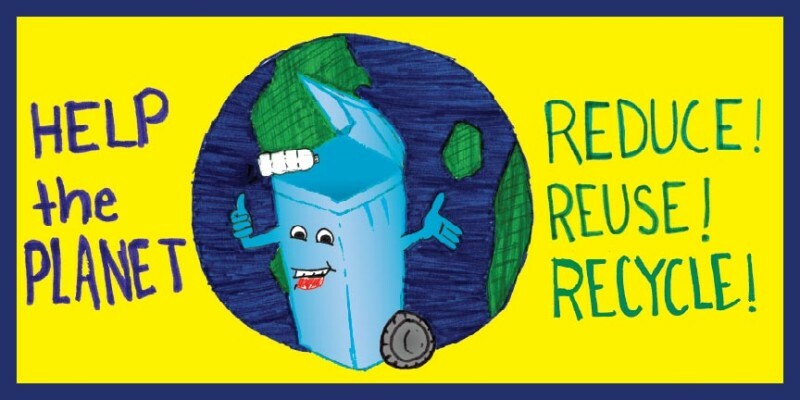 Poster Contest gives local students in grades K-12 a chance to creatively promote recycling and litter prevention in their community. The colorful winning artwork helps to reinforce the City’s litter prevention and recycling messages at big-belly trash bin downtown locations and as recycling and refuse trucks wind their way through City of Santa Cruz neighborhoods—be sure to watch for it! This entry was posted in City Beat, Featured, Local Loop and tagged in cit of santa cruz, litter prevention, poster contest, recycle, santa Cruz students, waste reduction. Bookmark the permalink.